Bone building enables treatment with implant for practically everyone! 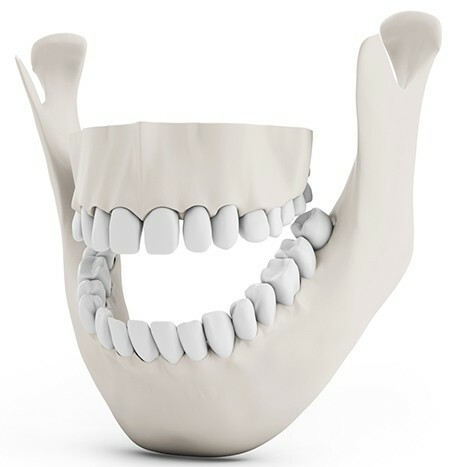 With bone being imperative to an implant treatment, lacking or insufficient bone needs to be compensated for with bone building where the implant shall be made. There are various reasons for insufficient bone in the jaw. For the upper jaw the main reason is that the sinuses (nasal cavity) will expand with age. To add bone to the cavities, a method called sinus lift is often practised, where bone replacement material is being used. Another cause for less bone, might be that the bone mass will redraw after an extraction. For the lower jaw, the main problem is the thickness of the bone mass and the underlying nerve (Nervus Mandibularis). When building bone we use a bio compatible material called Bio-Oss, which the body is willing to accept. New bones need to be built as required for the implant treatment. The Sinus lift method can be described as a window opened up in the mouth all the way to the Sinus. The Sinus is shut with a soft tissue along the walls of the Sinus. The tissue is flexible and can be used as a kind of tent. And this tissue tent is filled with Bio-Oss, parallel with the closing of the window. After a period of at least 6 months, during which the healing should take place, the first implant may be used. A bone build up may also be recommended after a normal tooth extraction, to enable the best implant treatment. In most cases X ray pictures are sufficient for the assessment of the need of bone building before the treatment. However, certain factors are not always evident, until the bone is visible during the actual Implant treatment. If the bone is insufficient, a bone building is made either in combination with an implant or we begin with a bone building and wait until after the healing to perform the implant treatment.